MOM's Organic Market Blog | Individuals from MOM's sharing all kinds of cool stuff. (Left) Yellow aphids cover our Swamp milkweed plants. (Right) An Oriental beetle snacks on a blossom of our Virginia rose bush. All too often, out comes the bug spray, and more poison finds its way into the environment. But the spray doesn’t help for long. New pests soon move in. Fortunately, there is a better solution: get more insects! Our yard is quite popular with six-legged visitors. (Left) This Wheel bug (Arilus) was photographed busily laying eggs on our Red-osier dogwood bush. (Middle) These Milkweed bug nymphs enjoy a free meal from our Swamp milkweed seed pods. (Right) Get a room, please. Some Robber flies stealing a tender moment on our deck railing. The problem most gardeners have isn’t insects in general. At least it shouldn’t be, as insects provide valuable benefits to the garden, from pollination to soil aeration. The problem usually is specific insect species that cause excessive damage. One way to minimize that problem is to encourage a wider variety of insects in your garden. You, in essence, create a buffet which attracts diners to keep your problem insects under control. (Left) Hummingbirds are frequent visitors to the Trumpet honeysuckle vine we planted. (Center) Hummingbirds also eat insects, like the tiny ants attracted to our Summer Sweet bush’s blossoms. (Right) A swallowtail butterfly, having narrowly missed becoming someone’s lunch, enjoys its own from the flowers of our Bottlebrush buckeye. No, I am not suggesting an alternative, protein-heavy diet for you and your friends. The diners you want to attract are insects, birds, and other small creatures. 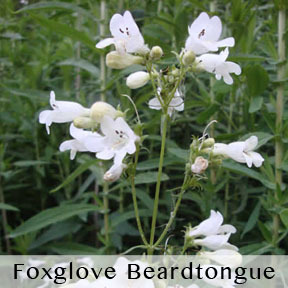 The trick is to keep enough of them in your yard at all times that they keep those pest populations from booming. A steady and reliable food supply is the key. (Left) We don’t really mind this Banded tussock moth caterpillar taking a few nibbles from our tree. (Right) An Eight-spotted forester moth took a rest on our patio door one afternoon. 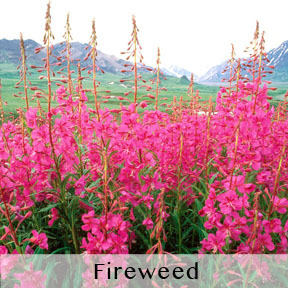 The never-ending buffet should start with a variety of native plants in your yard. 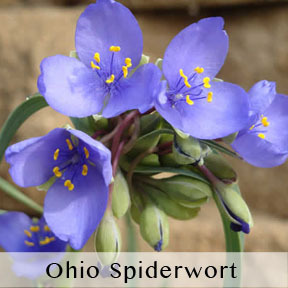 Native plants provide food (nectar, pollen, leaves) and habitat for a greater variety of the insects native to your area than do plants from other parts of the world, country, or even state. Some of the insects they support in turn become food for others. Your buffet is now offering a vegetable and a meat course. (Left) Our Boltonia flowers offered an interesting place for a Pisaurina spider to hang out and ambush a fly. (Right) This tiny piece of mosaic art is actually an Ailanthus webworm moth we spotted near our doorway. What happens when a pest species starts to increase in number? 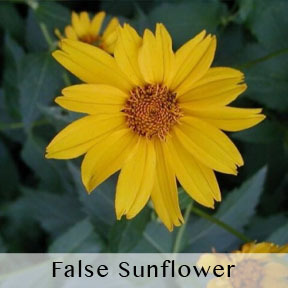 Your garden’s variety of native plants ensure there are now predator insects already present and ready to dine. You will still see some periodic increases in certain insects, but by allowing the predatory insects to come to the rescue, you help them to create the next generation of buffet diners, and the next after that. Different scales, but both are predators in the garden. (Left) Nasty-looking creatures are ladybugs, at least in their tiny larval stage. This one had great numbers of aphids to eat in our garden. (Right) Measuring about four inches long, this mantis resting on our fence will devour bees and any other insect it can catch in its grip. 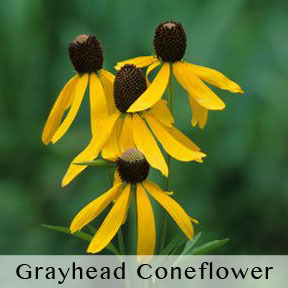 You can start small by planting a few native flowers, which will add a splash of color and attract pollinators. Add more natives as time allows: flowers, shrubs, vines or trees. As your yard’s ecological web grows more complex and robust, it builds up its own natural resistance to any one insect pest. It also acts as an ecological oasis for insects and birds. (Left) This Monarch butterfly, resting on our native Hibiscus moscheutos, may have been the momma who laid eggs on the nearby milkweeds. (Right) A few weeks later, a Monarch caterpillar was happily chewing on our Swamp milkweeds. A wide variety of insects in your yard will keep your garden healthy, and interesting too. Those spiders on patrol offer good snacking for birds stopping by on their rounds. You may even start to appreciate and welcome some of the insects you formerly considered pests. With their numbers under control, they are just food for your (non-human) guests. Your new motto: more insects, please! (Above) A Clouded yellow sulpher butterfly enjoys nectar from our American wisteria. 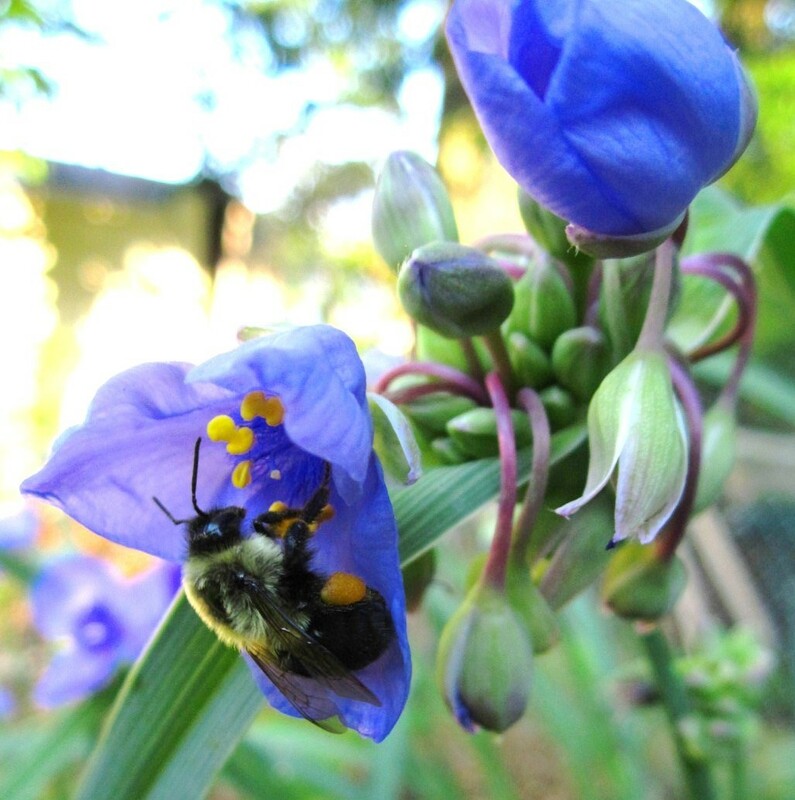 (Top of Blog) A bumblebee sticks his pudgy face into an Ohio spiderwort blossom. Roland is a native plant enthusiast, wood carver, and occasional animator who lives and gardens with his wife and two cats in Kensington, Maryland. He works at MOM’s central office. 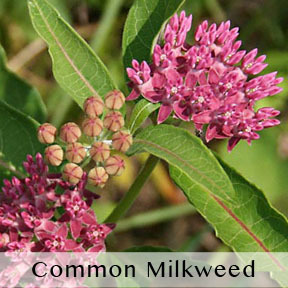 To look up information about plants native to your region, visit the Lady Bird Johnson Wildflower Center’s Native Plant Information Network (NPIN). Whether eating, exercising, or something else, it’s hard to change the routines we’re used to. But humans are adaptable. We can adjust to practically anything, and this is great news when it comes to changing habits. 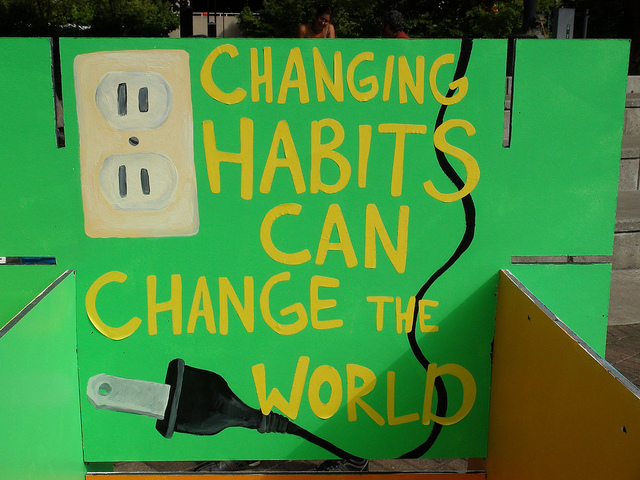 As I learn more about global climate change, it’s clear that a LOT of us need to change our habits. I’m working on making changes myself- turning off water while soaping up dishes, bringing reusable bags to the grocery store and mall, refilling my water bottle, bringing reusable containers to restaurants, etc. But having good intentions doesn’t make it easy. I remember suggesting to my mom that she reuse produce bags instead of recycle them. She agreed that it was a good idea, but explained that it was a habit she didn’t want to change. “It’s just one more thing to have to remember and change about my routine,” she said. But Mom, I thought, the environment!!! But I get it – the thought of changing a habit can be overwhelming. That’s why I was excited to read about activation energy in The Happiness Advantage by Shawn Achors. To start a new habit, you need to lower the activation energy. Shawn wanted to start working out in the morning. What did he do? He lowered the energy it took to get up and ready in the morning by sleeping in his gym clothes. By the same token, you can raise the activation energy to break a habit. Shawn wanted to stop watching TV after work, so he put his remote in a drawer several rooms away from the TV. As a replacement, he put a book by the couch. Amazingly, this works on the brain. Once you’re in your gym clothes, your brain actually thinks it’ll be easier to go for a run than change into different clothes! It’s not logical, but it’s true. I’m trying to do this more: I collect my produce bags and bulk containers in one spot so I don’t have to find them when I’m ready to shop. I pack a refillable bottle and food so I don’t have to buy bottled water or unhealthy snacks if I get hungry. I turn off my computer so I can’t “get on for one second” – and end up spending hours on Pinterest or Facebook. What habits do you find hardest to break? How have you lowered or raised activation energy to change a habit? Eva works at MOM’s Central Office. These words are so powerful to me. Honey is just the tip of the iceberg when it comes to these astounding creatures. 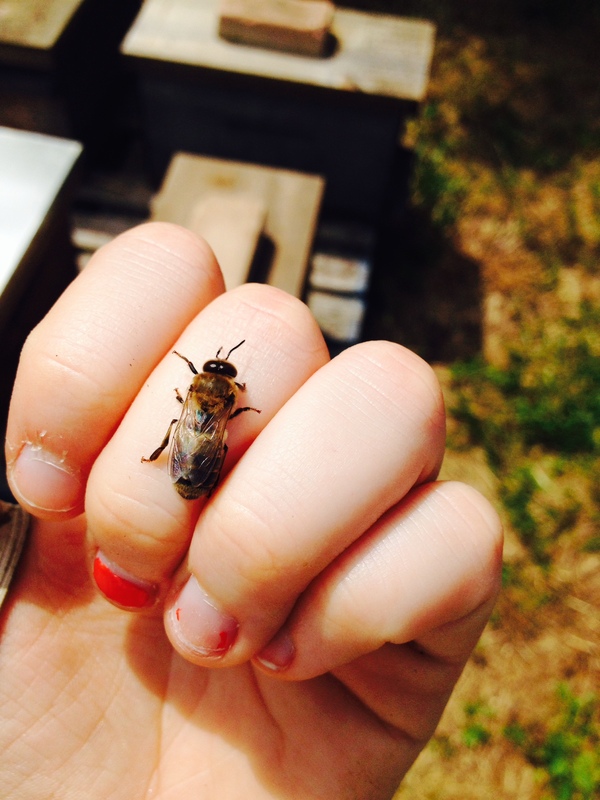 When I started beekeeping I had no idea what I was doing. As a little girl I was fascinated by insects and their tiny, yet tremendous lives, and I knew honey bees were the most interesting “bug” I’d read about. I was traveling when my dad called to say he started a few beehives in our yard. I flew home and upon first sight I fell madly in love with the thousands of humming beauties. I worked with bees during the rest of my travels and learned a lot from the different beekeepers I met in many places. Everyone I encountered knew so much yet so little all at once. 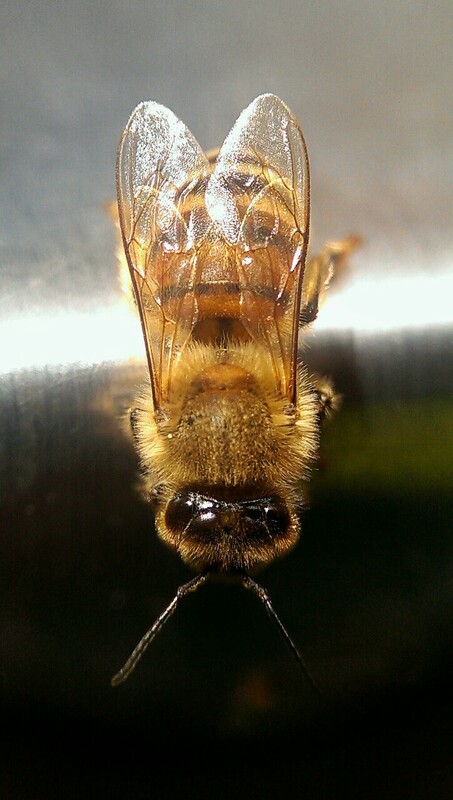 Honey bees have been here for millions of years yet they have not changed much- a perfect species all along. They are unparalleled in the animal kingdom. Each bee in the colony has individual traits yet as a whole the colony has a social partnership. They have a language all their own that far surpasses the most intricate human language. They are the most studied insect on earth. We should all learn from the bees. Not only do they contribute wax, pollen, propolis, royal jelly and of course the illustrious honey, they are also the most fundamental pollinator of our crops. The life sustaining nourishment we depend on. Eight years after we started and with 130 colonies, I am still learning so much about these beautiful, buzzing creatures. They have taught me more about life and love and what really matters in this world than I ever could have imagined. So listen to the bees. Do some more research, read books, watch documentaries, go to local meetings, talk to people, but just know… once you become a part of the bees there is no turning back. You’ll be forever captivated. Lynn works at MOM’s in Herndon. 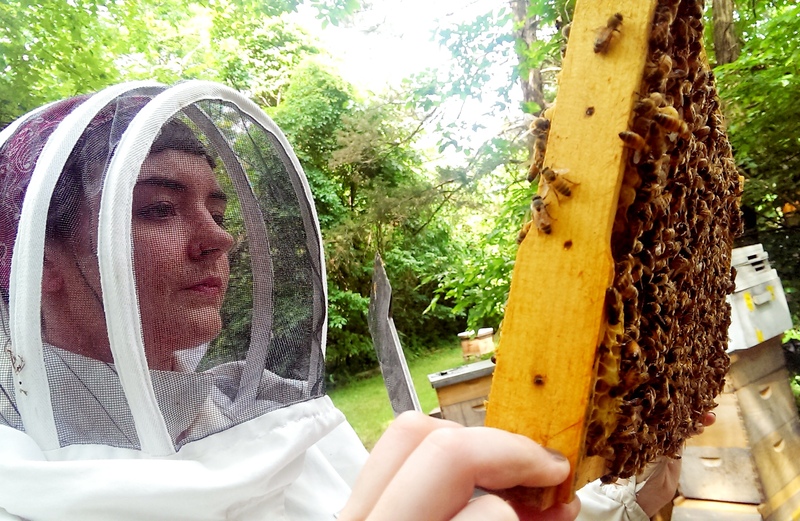 See more of Lynn’s pictures on her bee tumblr, and see her video of the roof bees at MOM’s of Alexandria. Happy Honey Bee Day! National Honey Bee Day is this Saturday! One way to “bee” friendly is to create a pollinator-friendly garden by avoiding pesticides and planting flowers that bloom at different times. For more pollinator-friendly suggestions, Beyond Pesticides has a great resource! You’ve probably heard about the declining bee population, maybe from the news, the Vanishing of the Bees, or Save the Dandelions. 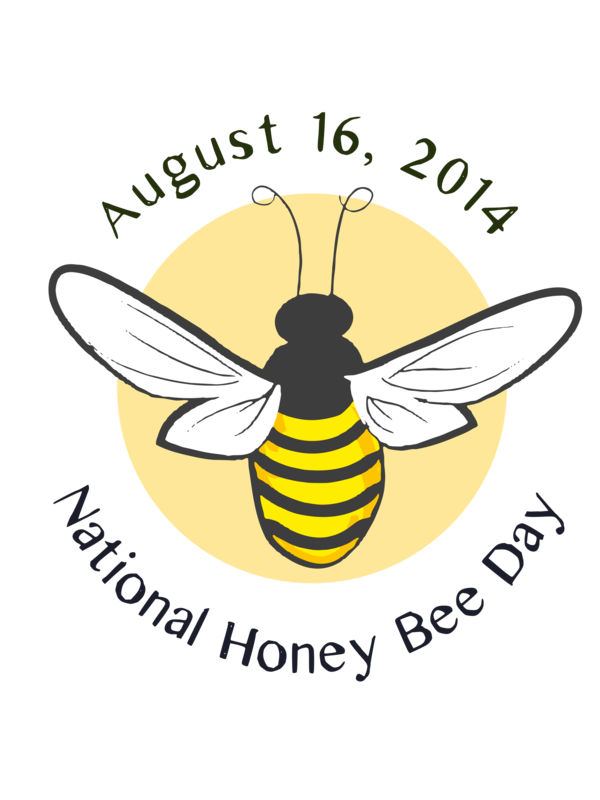 Maybe you haven’t heard that National Honey Bee Day is Saturday, August 16th! 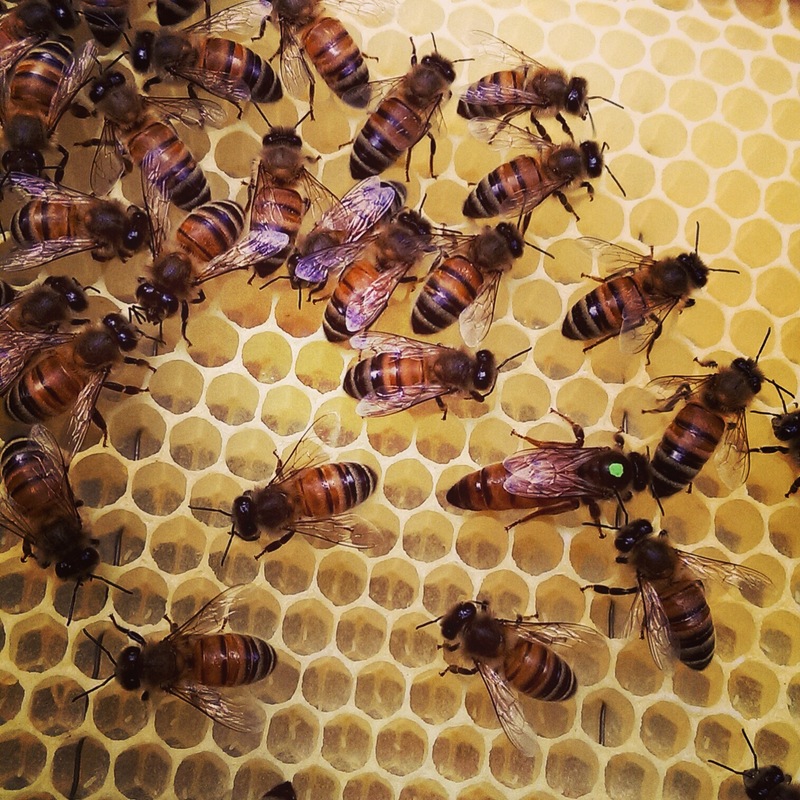 There are a bunch of factors that contribute to the declining bee population. A big one that is getting more and more attention is the neonicotinoid class of pesticides. These are systemic pesticides, which means that once they are applied, that are absorbed and present throughout the entire plant. And like all pesticides, they don’t disappear – they stay in our soil and water systems, wreaking long-term havoc. reduce the amount of pollen that bees gather, which is what the bees eat. cause them to become prefer the sweetest pollen and avoid less sweet pollen, which is a critical source of nutrients for bees. interfere with the bee’s ability to find a mate. European Union has passed a two year ban on several neonicotinoids including clothianidin, imidacloprid, and thiamethoxam. I hope the US will do something similar. For more info, check out BEE Protective by Beyond Pesticides! As retailers we sometimes find ourselves working with companies that do not align with our values to a T. For example, we carry brands like Cascadian Farm and Honest Tea which are owned by parent companies that have fought against the non-GMO propositions we support. However, MOM’s Purpose is to protect and restore the environment, and our number one priority is organics. We choose to support organic farming whenever possible, though we may disagree with other policies of some businesses. I haven’t liked Eden’s for years. I think they’re zealots and don’t hold my or the general industry’s values. However, we don’t ban products based on ownership ideologies- that is not our place and would be a very fuzzy exercise of highly subjective analysis. I’m constantly getting called upon by customers to stop selling many products for a plethora of reasons having to do with ownership ideologies. However, that is the consumer’s prerogative. There are a lot of great things about private ownership. It allows MOM’s to pay fair wages and stay independent. By the same token, it means that other privately owned businesses can do the same. Whether I agree or not, I believe it’s important that people can act upon their own ideologies. MOM’s goal is to stock a great variety of organic products, and to let customers vote with their purchases. A few customers have suggested that we put up a sign about Eden’s birth control stance, and here’s why we won’t: We don’t get in the way of customers’ choices to buy what is best for their health and their values. We trust our customers’ decision-making processes. And if customers stop buying Eden’s, MOM’s will stop selling them. There are so many important causes, and so many things to consider when purchasing anything. Sometimes I wish I could avoid purchases altogether! I get frustrated when the “good guys” start to seem like “bad guys.” But with any issue, there are multiple points of view, and some prevail over others. 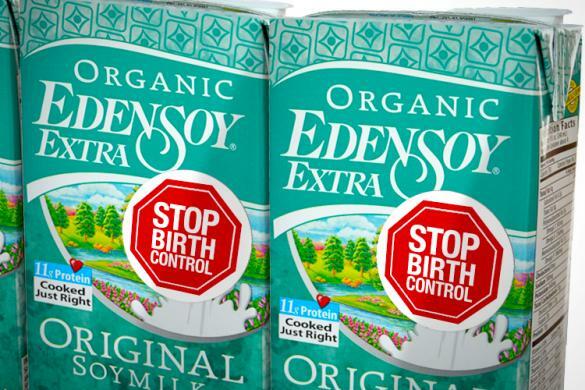 If you don’t agree with their policies, by all means stop buying Eden’s. That will send the strongest message. Jessup has a locally-grown (organic, of course) oddity on the shelf right now: the Little Potato Cucumber! Local produce find: Little Potato Cucumbers in Jessup! The texture is similar to a regular cucumber and the flavor is mild, mellow and cool, much like traditional cucumbers. If you get a chance to check it out, please do! Alyssa works in multiple MOMs locations!